If you count the Raspberry seeds there are five seeds in this muffin mix. Recipe makes 12-15 muffins. 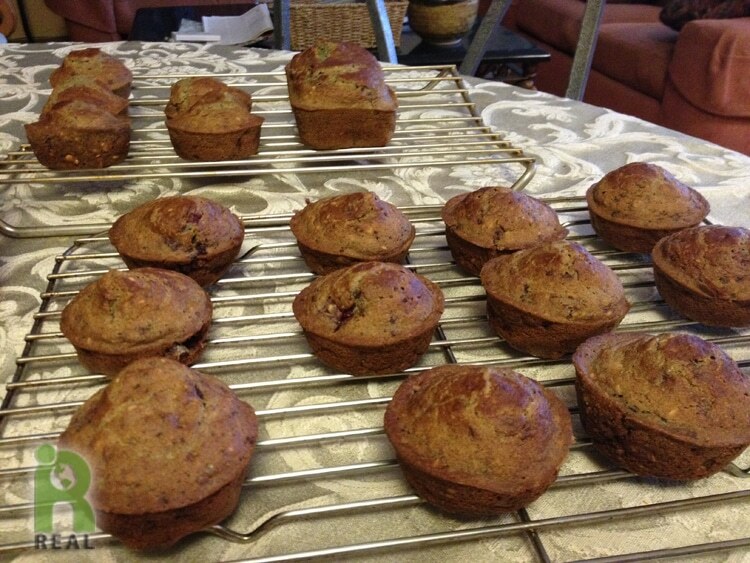 Prepare muffin tins by lightly greasing with oil or vegan butter or line with paper muffin cups. 2. In a small bowl mix together flax seeds in 1/2 cup water and let set for 15 minutes. 3. In another bowl mash the banana with the tahini. Add the sugar, vanilla, lemon juice and peel. Continue creaming the fat with the sugar. Add vinegar and mix. 5. Pour in 1 cup water and beat the batter with a hand mixer or whisk. 7. Let set for 20 minutes. 8. Boil remaining half a cup of water and add it to the batter at this time. Fold gently until thoroughly mixed. 9. Spoon about 1/4 cup of batter into each muffin cup. 10. Bake for 25-30 minutes until muffins are firm and golden brown. 11. Remove from oven. Let cool. 12. Remove the muffins from the tin, place in a basket and serve with your favorite spreads.